Here's all you need to know about Japanese wedding kimono. As Japan’s ancient capital for over 1,000 years, Kyoto is still the home of Japan’s traditional textile industry. From the hands of Kyoto’s weavers, dyers, and other kimono artisans, top quality bridal kimono are sent to all over Japan. 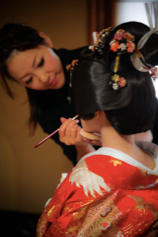 Kyoto Weddings is based in Kyoto, allowing us to work with textile artisans to provide exclusive choice for guests. Partnered TNC Bridal Service, we aim to support the traditional textile industry of Kyoto by allowing international visitors to experience this wonderful textile tradition. 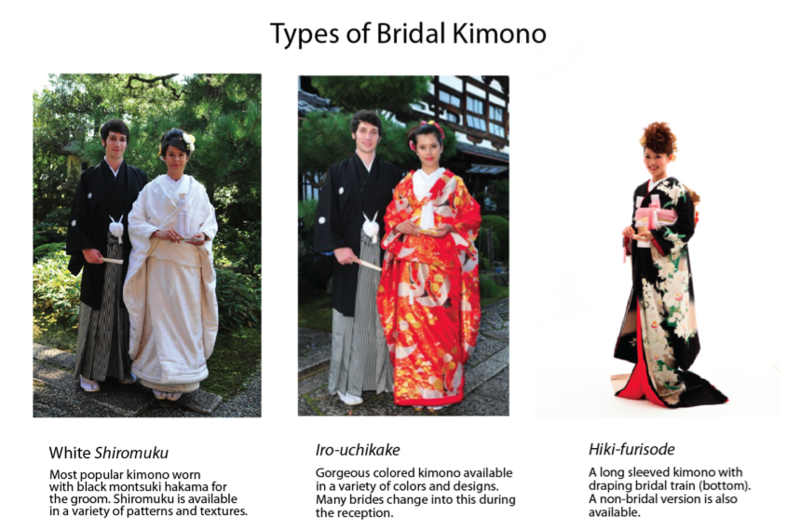 - Bridal kimono includes a white shiromuku kimono for the bride and black montsuki kimono for groom. Kimono other than the white shiromuku are available : coloured iro uchi-kake and the long-sleeved hiki-furisode . Additional fees apply. - Kimono are made for Japanese sizes. Additional fees may be added depending on height and size. Shiromuku 白無垢 - Originally worn at weddings in samurai families, the shiromuku has become one type of wedding kimono worn by brides in Japan. White has symbolized the sun's rays since ancient times, and from the Heian period, pure white bridal kimonos became prized. The shiromuku stands out due to all its parts -- over-robe, under-robe, obi sashi, etc.. -- being pure white. Another reason for the pure white color of the shiromuku is that the bride may "take on the colors of the groom's family she is marrying into". Wataboshi 綿帽子 - The wataboshi (bridal kimono hood) is derived from the "katsuki", a hood worn outdoors by married women in samurai families from the Muromachi to Momoyama periods. From the Edo period, this custom was taken up by younger women. 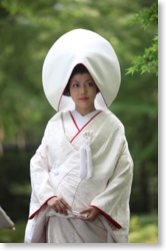 Originally worn outdoors to keep away dust and prevent from the cold, the wataboshi now is worn as the equivalent of the bridal veil in Western tradition. Wearing the wataboshi hides the bride's face from all others except for the groom until the end of the wedding ceremony. The white wataboshi is worn only outside with the shiromuku, not with colored wedding kimono or during indoor receptions. Tsunokakushi 角隠し - Traditional hair piece (wig) in the the "Shimada" style (worn by single women in the Edo period). Usually worn by brides in shiromuku or iro-uchikake kimono. The Japanese term literally means, "hiding horns" and symbolizes the bride will be kind and obedient to the husband. The idea of horns comes from the folk belief that women grow horns and turn into a demon after becoming jealous. Hakoseko 筥迫 - A small pocket case accessory when wearing uchikake kimono, usually made of gold brocade or embroidered cloth. The origin of the modern Japanese cosmetic case, the hakoseko was traditional used by samurai brides in the Edo period and the contents includes traditional lucky charms such as incense, lip crimson, and a mirror. Originally worn for practical use, it now has a more of a decorative role but is indispensable in traditional Japanese wedding dress.